Mark's Tickets is the best place to find tickets for Philadelphia Phillies fans. Just check this page for any new events or schedule updates throughout the year. We sell tickets to every Philadelphia Phillies game around the world. We know how passionate Philadelphia Phillies fans can be about baseball, so we make sure to have hundreds of tickets for every game available right up until it starts. For those looking for cheap Philadelphia Phillies tickets, we offer tickets starting at very low prices (many times below face value). We offer tickets in most sections of every venue that you can see Philadelphia Phillies. Simply choose the city or venue that you are interested in below, and you will be able to see all of the available seats. Do not forget that Marks Tickets also specializes in sold out Philadelphia Phillies tickets. No longer will sold out shows prevent you from seeing Philadelphia Phillies. The Philadelphia Phillies are a professional baseball team that plays in the MLB. 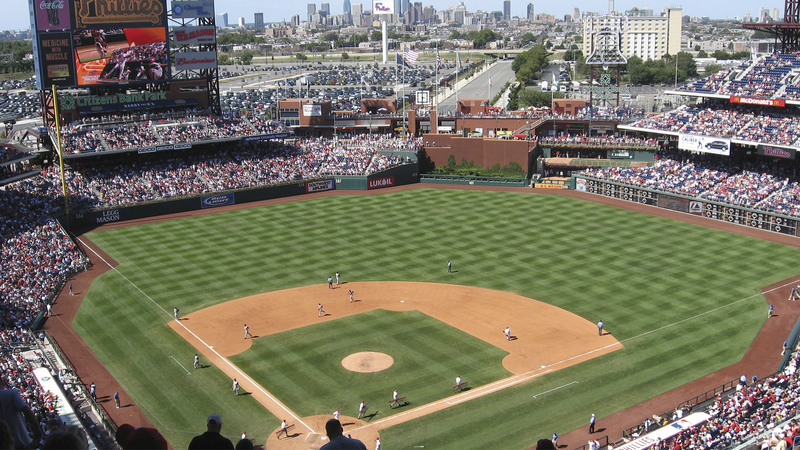 The Phillies play their home games at Citizens Bank Park in Philadelphia, Pennsylvania. With 162 games per year, and 81 being home games, The Philadelphia Phillies are a Major League Baseball team. They are the oldest continuous, one-name, one-city franchise in all of professional American sports, dating to 1883. The Phillies are a member of the Eastern Division of Major League Baseball's National League. Since 2004, the team's home has been Citizens Bank Park in the South Philadelphia section of the city. The Phillies have won two World Series championships (against Kansas City in 1980 and Tampa Bay in 2008) and seven National League pennants, the first of which came in 1915. The franchise has also experienced long periods of struggle. Once the modern World Series began in 1903, it took the Phillies 77 years from that point (and 97 years from the club's establishment) to win their first World Series—longer than any other of the 16 teams that made up the major leagues for the first half of the 20th century. The 77 years of drought is the fourth longest World Series drought in Major League Baseball history. The longevity of the franchise and its history of adversity have earned it the dubious distinction of having lost the most games of any team in the history of American professional sports. Notwithstanding the collectively poor performance over the years, the Phillies have performed much better in recent seasons, winning five consecutive division titles from 2007 through 2011.